VIETNAM EXPORTS MORE FRUIT OF THIS VARIETY THAN ANY OTHER. THE FRUIT IS LARGE TYPICALLY WEIGHING 0.5-1.5 LBS., AND HAS A SEMISWEET SNOWY WHITE PULP. 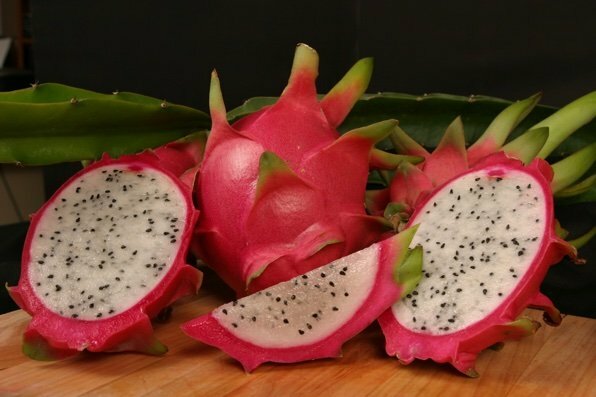 IN FACT, THE DRAMATIC COLOR CONTRAST BETWEEN THE INSIDE AND OUTSIDE OF THE FRUIT AS WELL AS ITS IMPRESSIVE SIZE ARE WHAT MAKE THIS VARIETY SO POPULAR AMONG GROWERS AND CONSUMERS WORLDWIDE. THIS VARIETY IS SELF POLLINATING, AND IT WILL SET FRUIT WITHOUT BEING HAND POLLINATED.